3/16/2012 – Tactics are the building blocks of chess, without which strategy will fall flat on its face, and for this reason regularly working on tactical test suites is always of interest. While you can buy any number, whether from the ChessBase Shop, books, or other, Fritz 13 also provides the means to easily construct endless new ones for you to test yourself. Learn how in this tutorial. 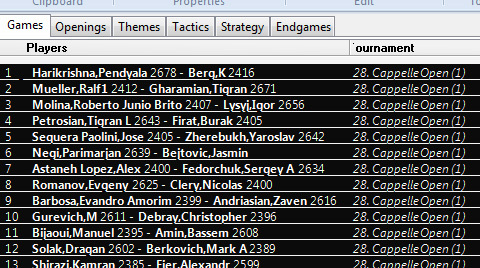 Tactics are the building blocks of chess, without which strategy will fall flat on its face, and for this reason regularly working on tactical test suites is always of interest. 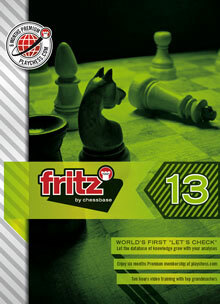 While you can buy any number, whether from the ChessBase Shop, books, or other, Fritz 13 also provides the means to easily construct endless new ones for you to test yourself. 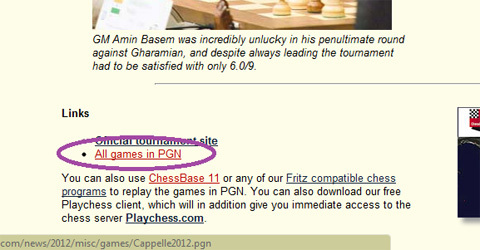 Please note that if your base is already in native ChessBase format you can skip this step. The first thing is to select and prepare a database of games. 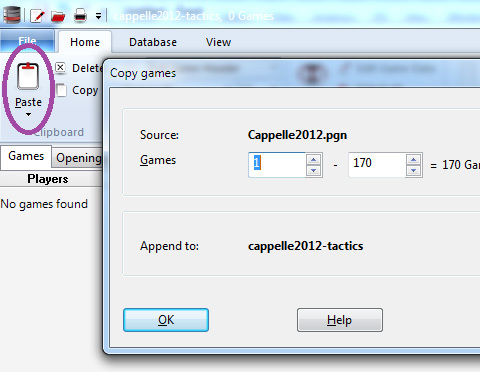 For the purpose of this tutorial, we’ll select the PGN base of games from the recent Cappelle-La-Grande. The base includes 170 games which should provide plenty of material. After downloading it, we need to convert the file to the CBH format, since it is required to support the training questions. 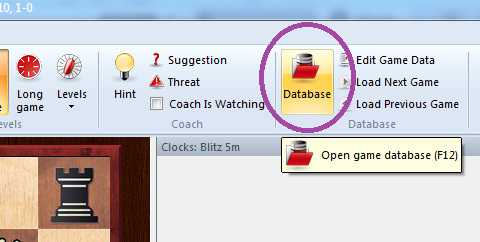 Databases button above to tell it to display PGN files. 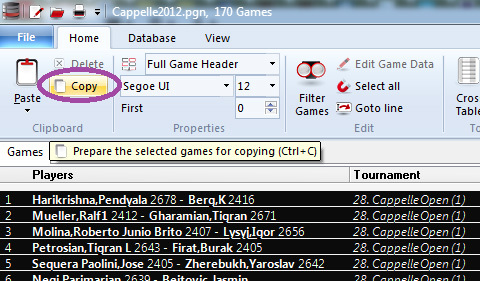 Highlight all the games (CTRL+A) then copy them (CTRL+C) into the clipboard. You can click on the button at the top or press File and then New. You are now ready to proceed to the next step. 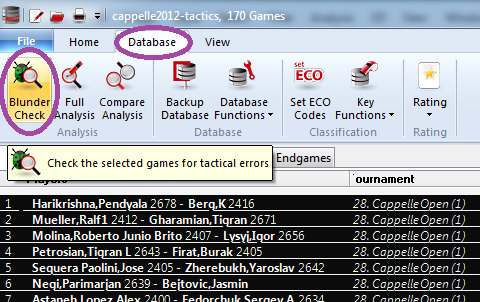 While you probably know that Fritz 13 has a plethora of functions to automatically analyze your game, you may not be aware that the full-game analysis features can also be used on entire databases. With the database list open, you must first highlight the games you want analyzed. You can choose some or all using the standard Windows functions. If you want to use a different engine than the one that was being used, you will need to switch back to the main screen and change it, as Fritz 13 will use the current engine opened. In the Database tab at the top, select Blunder Check which is the simplest and quickest, though Full Analysis also works. A window will open with an assortment of functions. The first is to check the Training. I also choose the Depth per move instead of Time, and keep it something low such as 12. On my computer that lasts a fraction of a second. If you choose Time (seconds per move), bear in mind that the engine will spend that time on every single move of every single game, and this can take a long time. For tactics training, a very low depth is enough, and the chances are the extra time or depth won’t really provide many more positions to test with. Finally there is the Threshold. This determines what it calls a ‘blunder’ and what positions will be added. The number is in centipawns, thus 100 means a full pawn. I usually choose 80 since sometimes it will see a pawn won, but with some miniscule compensation. Once the parameters are chosen, click Ok, and feel free to do something else. The batch analysis of thousands of moves takes time. Now that the games have all been analyzed, let’s separate the ones with the training questions. Go to the Home tab above, and click on Filter Games. 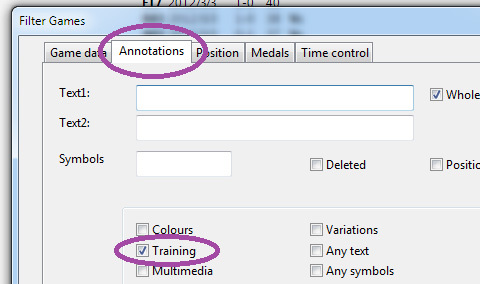 Select the Annotations tab, put a check in Training, and click Ok. It now shows only the game with training questions. If you want to start testing them right away, just double-click on the top one and get going, but if you want to create a separate base with them, follow steps 4) and 5) in Preparing a database at the beginning of this tutorial. 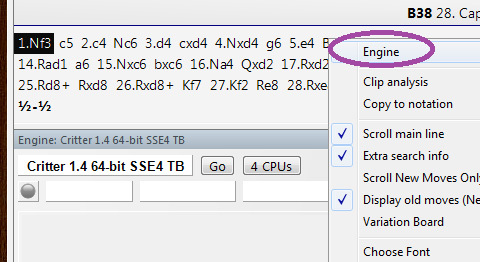 A small word of warning: the program will select mate in ones just as easily as complex combinations, so long as they fit the settings chosen. On the upside, you can be certain the position chosen does not have several solutions of equal value, and it will choose moves played just as easily as moves missed. It is worth adding that there are plenty of ways to play around with this to find many more test positions from even a single game. The key is that the Blunder Check function will also scrutinize all annotations as well, so you can have an engine analyze all the games at an extremely shallow depth, with a low threshold as well, and produce a ton of annotations. 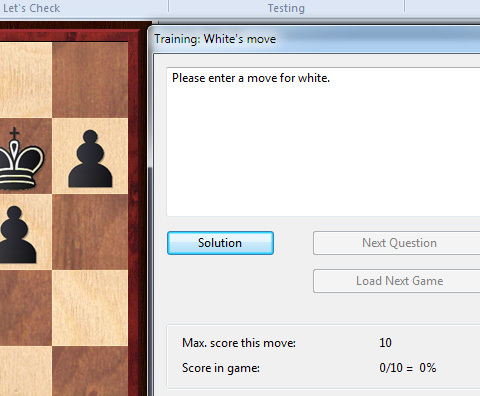 Then run a standard deeper Blunder Check on all the moves and annotations and watch it produce a ton of new test moves. Price: 49.90€, shipping immediately, per download or on DVD. When you click on the "To Cart" button you will get a choice of ordering the program on DVD to be delivered by post or whether you want it right away as a download from the shop.